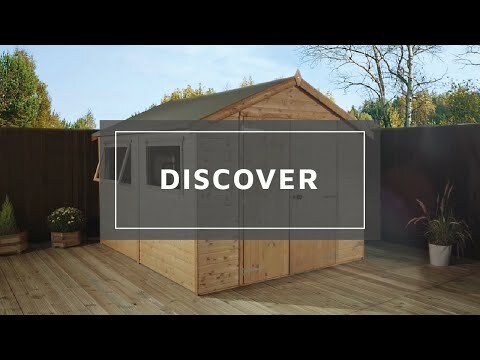 This Waltons 10ft x 10ft Reverse Apex Wooden Workshop is a high quality garden building that provides storage and work space. The double doors provide easy access into the wooden workshop which offers room for a workbench, shelving and to store away gardening items. A rim lock is supplied with the double doors to keep the wooden storage workshop secure. Constructed using 12mm tongue and groove cladding throughout, this wooden garden workshop is a durable building. The strong interlocking design of tongue and groove cladding offers great strength to the build and is ideal for storing heavier gardening items. This style of cladding prevents water ingress, creating a weatherproof garden workshop. Thick 2" x 1" internal framing is used to ensure a strong, durable build. The opening window is glazed with shatterproof styrene, a much safer alternative to traditional glass. To offer further protection from weather damage, this timber workshop is supplied with a quality mineral roof felt. Complete with a ten year anti rot guarantee, you can be sure that this workshop is a secure and long lasting garden building. The traditional apex design will look great in any style of garden and helps to prevent the build-up of rain water, offering further protection against wood rot. Review:Not the best quality but probably about right for the price, barring the issue over the felt.